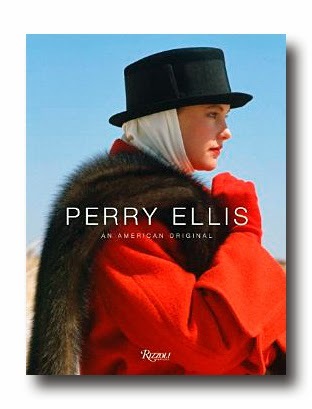 "Ah Yes, I Remember Him Well..."
﻿﻿Last night I attended a party in celebration of the launch of Perry Ellis: An American Original, a landmark book by Jeffrey Banks, Erica Lennard and Doria de La Chapelle, published by Rizzoli (288 pages, hardcover). Hosted by Perry Ellis and the Council of Fashion Designers of America, the event was held at Parsons New School of Design on 7th Avenue and 40th Streets, in it's huge second floor auditorium. Even walking up the stairs to that space, where I had attended so many major fashion shows, brought back memories. And the evening was certainly filled with memories. I hate to use this expression, but it did feel like "old home week" (I especially hate the word "old"), but in a sense, it was like having my whole fashion life flashing before my eyes. The evening and the event, was very personal to me on many levels. I met Perry Ellis at the onset of what would be a remarkable, and all too short, career. 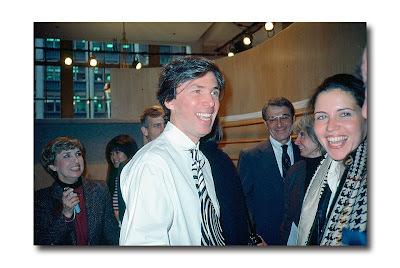 He was at John Meyer of Norwich and I was a fledgling editor at Harper's Bazaar. I was immediately struck by his attractiveness (both inside and out). The Virginia born designer was the consummate Southern gentleman: the antithesis of a loud, bawdy New Yorker. We met for periodic lunches at Sardi's (his favorite restaurant) and I was the one who brought him to the attention of Carrie Donovan, who was the Senior Fashion Editor of Harper's Bazaar (it would be the start of a very long friendship between the two). I attended every one of his fashion shows, and was very honored to have been asked to share my personal remembrances in the book. And stacks of the book were ready to be signed, with the authors, who were all there on Thursday evening, seated on a long table. The room was not only filled with guests, but there were 69 Perry Ellis ensembles, dating from 1978 to 1983, displayed on mannequins, in addition to several blown up photos strategically placed, and videos which replayed some of his landmark fashion shows. What struck me most, was that even though the time and memories are dated, there was really nothing outmoded or passé about the designs on display, many of which looked amazingly fresh, quite up to date, and on trend (well okay, maybe with the exception of his exaggeratedly broad 80's football shoulders which are not flattering to anybody). There were a few pieces (the Sonia Delaunay cashmeres and animal printed shetlands for example), that I would 'kill' to have in my closet right now. Just consider this: nobody made better coats or more distinctive sweaters, than Perry. He injected humor and whimsy in the most classic elements, favored slouchy silhouettes, hefty and textural donegals, plaids, and flannels. He loved to play with volume and proportion; and had a penchant for exaggeration; bold, art inspired pattern; longer hemlines; pleats. And at a time when fashion is having a real shirt moment, let's not forget that the classic button down oxford cloth shirt (in white, pale pink, pale blue, pale lilac), figured prominently within Perry's collections and that Perry's personal signature was his pale blue oxford cloth button down shirt with pleated shoulders and buttoned cuffs, worn, more often than not, with khakis (his own signature blue pin point oxford shirt and personal khakis were the last items on display). .Midway into the evening, Parsons' Dean of Fashion, Simon Collins, made a few remarks. He said the evening was all about "legends", beginning with Perry Ellis, even though Parsons could not claim him as an alumni. (In fact, Perry went to college but not design school and he could not sketch!) But he observed that Jeffrey Banks, who co-wrote the book, could be claimed as both an alumni of Parsons AND a Bone fide "legend", as well as Marc Jacobs, who also wrote the forward to the book. And then he continued, "looking around this room, I can see there are plenty of legends, including a legendary fashion photographer ("Bill, you know who you are", he remarked). From my point of view, there certainly were some legends in the room. Among them, Patricia Pastor and Jed Krascella (Perry's right hand design assistants who were always by his side and who I had the pleasure of working with for many years); Isaac Mizrahi, a Parsons alum who was an assistant to Perry Ellis (Isaac called Perry his "mentor" and "guardian angel" and said that everything he learned, he learned from Perry); Kay Unger, designer and chair of the board of governors of Parsons; New School of Design; Larry Leeds (whose company, Manhattan Industries) owned the Perry Ellis label; Stan Herman; Bethann Hardison; Jeanne Rosenberg (who was the vice president and merchandising director at Bendel's from six months before Ms. Stutz's arrival in 1957 to their joint departure in 1986, after the store was sold to The Limited); and Koko Hashim, whose impressive retail resume includes Bloomingdales' Fashion Director of Womens' Apparel. While she is now retired, she still keeps abreast of fashion, and noted that from her point of view, there is too much that is being "recycled" on the runways these days, and "it's not as good as the original". When I asked what designers she admires these days, she immediately said, "Alber Elbaz for Lanvin" because he has his pulse on what women want, and his clothes are soft, flattering, and not demeaning.